Celebrating its first year of operation, naming Pogo Carshare’s biggest triumph is easy for co-founder and entrepreneur Kieran Ryan — simply, that it works. I sat down with Kieran at Little Brick Cafe in Riverdale, and, properly caffeinated, chatted about Pogo’s first year in Edmonton — a city, by the way, where there was apparent skepticism about success for a carsharing model. Q: So, what is Pogo CarShare? A: It is a local, membership-based service in Edmonton that offers members 24/7 access to a pool of vehicles located within a defined, central zone in our city. 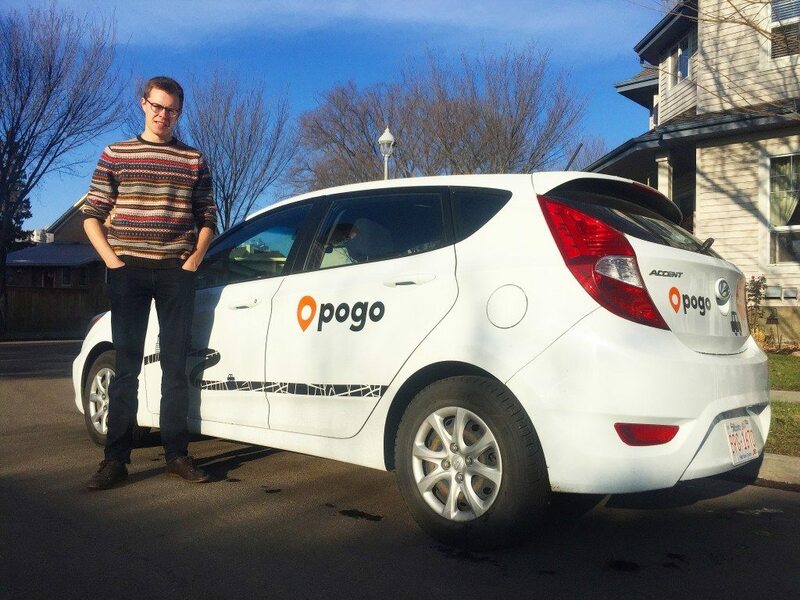 Q: What do you think Pogo CarShare brings to the city of Edmonton? A: Pogo CarShare provides a novel way of getting around that is complementary to transit, walking and biking. It changes the way people think about transportation. Edmonton is a car-based city. It is a city that has been built around the car, but there are lots of people who would like to use their car less for environmental or health reasons. I believe car sharing gives Edmonton, as a city, an option to choose a less car-intensive transportation diet and all the benefits that come with that: walkable neighbourhoods, less pollution and a healthier city overall. Q: Why do you think Car2Go didn’t want to expand to Edmonton? A: Car2Go, owned by big company based in Germany, is looking at worldwide expansion. It may just be that Edmonton is not first on their list. Also, Edmonton has tougher winters, it is colder and there is more snow. Car2Go has been excessively using SmartCars, which would have challenges here. Q: What does Pogo do to combat winter? A: For safety, we change over all our tires to winter tires. It’s important for Pogo users to feel safe. In addition, we make sure we chose good batteries. If there is a big snowfall, we go out and clear off the cars and make sure they aren’t in snow routes. If cars sit for more than a day — which is rare as most get moved multiple times a day — we pick it up and take it for a drive to protect the battery. Q: What have been your greatest challenges in this first year? A: Communicating to people that Pogo CarShare is something you can use no matter what your situation is. The most common response we get is, “Oh well, I have a car,” but the thing is, once you try it out, you start to think about your possibilities. Also, certain business challenges because everything we do is new. We are constantly having to explain to people that this is not a crazy idea, this is the future. Q: Do you use Pogo CarShare? A: Oh yeah! I actually just sold my car. We’re moving, and one of the considerations my wife and I made was, we have to live in the zone! Q: Would Pogo CarShare consider getting bike racks? A: Possibly. We do have to balance how much good bike racks cost and how often they would be used. Something we have been considering is adding specialized vehicles (vans, trucks, vehicles with bike-racks) that are parked in specific stalls and can be reserved. These would be vehicles you don’t need all the time, but are there for the occasions you do. Q: How do you see Pogo evolving in Edmonton? A: To continue adding vehicles and expanding our services. With that, also comes more integration with other transit options. For instance, we’ve recently partnered with TransitApp, a free app that facilitates people to start thinking in this multi-modal way. If you have to get from point A to point B, type it in and the app will tell you how you could get there: bus, LRT, Uber, Pogo, walk [and the cost associated]. Q: If you could communicate anything to Edmontonians about Pogo CarShare, what would it be? A: If you haven’t tried it out … just try it! What we find is once people try it out they feel like they get it and see how cool it is. Once you try it, you start to think about the possibilities! Even if you have currently have a car.